An assortment of plain steel woodruff key variants from The Hillman Group. 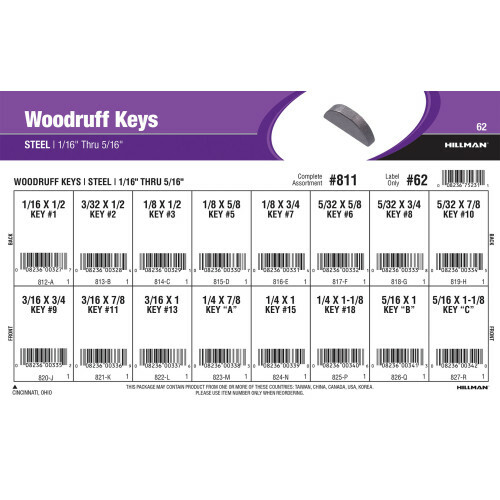 Woodruff keys are semi-circular keys that are commonly used for mechanical applications. It fits in a half-moon shaped slot, in a shaft, leaving the flat side of the tab exposed. They are designed not to function when excessive force is placed on the shaft. Variants in this assortment run 1/16" thru 5/16" in thickness. Full assortment contains sixteen (16) refills comprised of Hillman item numbers #812 - #827.